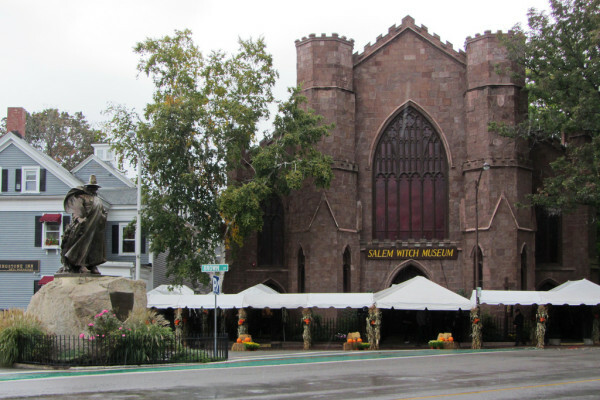 Many features of the modern-day city of Salem, Massachusetts can be most accurately described as tourist traps. The old, cobblestone streets are lined with all sorts of witch shops and attractions, like the Halloween Witch Ride and the Witch Walk. Flashy banners bearing witches and pumpkins hang over the streets on which the real accused witches walked more than three hundred years ago. The terrifying hysteria of the trials in 1692 has, over time, evolved into the witch culture that surrounds Salem today. The legacy of Salem’s famous witch trials is now seen in the numerous witch attractions and shops that often create a disconnect between the horror of the historical events and the superficial way in which they are remembered today. It’s impossible to go to Salem today and not see remnants of the witch trials, especially in Halloween season, because the legacy of what happened there in 1692 has created a big tourism industry. While walking through the streets and taking the trolley tour, I noticed that in the busiest parts of the city every few buildings is some sort of witch-themed tourist attraction or shop. Naturally, it’s easy to get lost in the overwhelming witch culture there. I bought a chocolate lollipop in the shape of the devil and ate it while I browsed witch-themed shirts, at the same time that a woman tried to give me a brochure for a witch hayride. There’s a witch school and shop that sells real magic things, and there are too many showy witch museums to count. Much of the city felt so artificial that it was hard to connect the Salem I’ve read about in textbooks with the one seen today. Today, Salem is a booming tourist city that benefits from its wicked past, but that wasn’t always the case. Sometime between 1692 and now Salem decided to embrace its history and capitalize upon it, instead of trying to forget about it. Almost immediately after the witch trials ended, the town felt guilt and shock at what they had allowed to happen. Nathaniel Hawthorne even changed his name to distance himself from his great-great-grandfather, John Hathorne, who was one of the judges during the trials. And now, only 200 years after Hawthorne changed his name to escape Salem’s still-strong stigma, Salem is a huge tourist destination all because of the infamous witch trials. Though it’s great that Salem was able to move past their scary history and create something fun from it, today some parts of the city can feel superficial. Clearly, the witch attractions are for fun and not to teach history, but sometimes it felt like the seriousness of Salem’s past was being overlooked. Throughout our day there, I had moments where I felt bad for indulging in touristy witch stuff that was made popular because of those nineteen people who died in 1692. It felt wrong to eat my chocolate devil when we stood right where Bridget Bishop was accused, and it didn’t seem right to advertise a witch booze cruise right across the street from the memorial for those who were killed. The showy advertisements for witch museums and halloween attractions were all oddly distanced from the trials of 1692. And with the whole tourism industry operating in Salem, it was hard to visualize Salem today as the same city where the witches were accused hundreds of years ago. Because of this disconnect, I think it’s very important to enjoy the witch culture that surrounds the city but also to take a moment to think about how tragic the events that happened there were. Though Salem is famous for the witch trials that took place there in 1692, today the city is capitalizing on its history to appeal to tourists. Brightly-advertised tourist destinations featuring witches can be found all across the city, while there are few accurate historical attractions. Because of this disconnect between past and present, the real gravity of the witch trials is often forgotten. Although it’s cool to see how Salem’s wicked past has influenced it today, I think it’s really important that anyone visiting Salem doesn’t let the Witch Walk or the Witch Dungeons overshadow the true history of the city. Olivia Rowland is a junior who loves to read and write. She currently works at the public library and someday hopes to see one of her own books on the shelves.